The following is an interview with former Major League reliever Jeremy Affeldt, who recently announced his retirement following the 2015 season. Jeremy played in the big leagues for fourteen years and split time between the Kansas City Royals, Colorado Rockies, Cincinnati Reds, and San Francisco Giants. 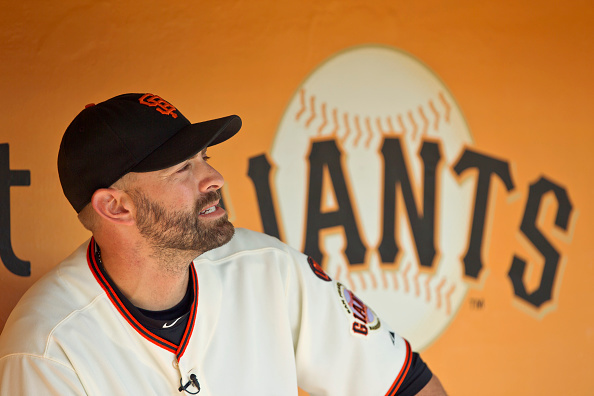 Perhaps best known for his playoff dominance during the Giants 2010 and 2012 World Series Championships, while also being the winning pitcher of record in the final game of the 2014 World Series, Affeldt had a long illustrious career as one of the best relievers of the 21st century. Jeremy and I talk about his decision to retire, the best moments of his career, what’s next for him after baseball, and the details of the charity group he started, called Generation Alive. PB: What was behind your decision to retire after a 14 year career? Now that your playing career has reached it’s conclusion, what is life like for you outside of baseball? What’s next for you? I have several things that I really want to do. I want to do a lot of public speaking. I really enjoy public speaking, I like the motivational side of things, I enjoy leadership concepts and creating new and culturally relevant ways to bring leadership to groups, whether it be athletes, companies, or kids or anything like that. I want to speak on those things and be around leaders and cultural changers. I do want to stay in the game a little bit because it is a part of me but I want to be in a different capacity. Not coaching but behind the scenes helping teams with leadership roles or maybe doing some tv stuff now and then. I have a few things on the docket there but right now I am taking a couple of months to rest my mind and Ill get going the first of the year. What will you miss most about the game? Honestly, some of that stuff, I don’t even know yet because this still feels like a normal offseason for me. I won’t miss the on field stuff. I accomplished what I wanted to accomplish and I don’t think I am ever going to think ‘Man, I wish I would have played just for this.’ That I am not going to miss. I am not going to miss the stress of the game and I find a lot of other ways to compete. I do a lot of hunting and fishing and I am starting to get into mountain biking and I am finding other ways to compete and get that adrenaline rush. For me, I am going to miss the camaraderie. I made a lot of good friends on and off the field and I did that strategically because I knew that would be a big hole in my life because I am around baseball players so much. I think I am going to miss just being around the clubhouse and hanging out with the guys on flights and having dinner with them and just being there for each other and working with each other and having that team relationship. I am going to try to recreate as much of that as I can now that I am retired but I didn’t have to create that while playing baseball. It was perfect. Having those kinds of friendships was big to me, and I am going to do my best to keep up with that. A lot of guys who retire don’t stay in touch with those guys but that’s just not me. I want to try to stay in touch with my buddies and stay connected. I think I’ll miss those relationships a lot. I had so many and obviously the World Series but based on how my story unfolded, being drafted by Kansas City, going through the minor leagues, spending four and a half years with them, I am very thankful I was able to get to the big leagues with them at a young age and was taught how to fail and succeed at a high level. I have a lot of respect for the Royals but I also had a lot of pain and frustration there. I was annoyed with baseball and I was put in a really dark place that was actually a benefit to me in keeping my career and finding out what it meant to me. So last year, the last time I was ending a season on that field and we lost 100 something games but last year I was ending that season Game 7 of the World Series as a champion. It wasn’t for the Royals it was for the Giants but not only was I in that game but I was also awarded the win for Game 7. I don’t think there is any better circle of baseball life than that. Where you come up with one team that drafted you and you spent some time on the big leagues for them and you end as a champion and a winner in that game knowing you lost a lot on that field. It’s not even an in your face sort of thing because I have a ton of respect for that win and in the game that we won. You don’t see a lot of World Series Game 7’s. Not a lot of guys get the win in Game 7. So to be the winner of Game 7 in that situation I don’t think there could be a bigger highlight to my career and it probably helped me with understanding it was time to retire. I had another year left on my contract so I wanted to fulfill that but that was a perfect way to end my career. I am very, very thankful for that and it was a perfect experience for me. Tell me about Generation Alive and what your organization hopes to accomplish? What inspired you to create the organization? I’ll make it a short story since it’s actually a long story. When I got traded to Colorado from Kansas City, I really just didn’t enjoy baseball. I didn’t want to play it anymore, I didn’t like it. I was losing a lot, I was a part of a lot of losing teams and I just wasn’t doing well. And I was really kind of lost on who I was. I was frustrated and didn’t know who I was or why I was doing it. I didn’t know who to tell or who to ask for help and I was kind of just out there in a real bad place. I remember leaving my hotel room, right after I was traded to Colorado, and I was walking to Starbucks and there was this girl, this 15 year old girl in the street, and she was sitting there, she was homeless and she had like a cracked lip, a black eye, torn clothes and she obviously just had a bad night and she was hungry. So I kind of squatted down to look her in the eye and she kind of pulled away from me and I said ‘I’m not here to hurt you, I want to give you something to eat.’ She just kind of looked at me and said yes please and I went inside Starbucks and got something with a ton sugar in it and one of the those healthy slushy green drinks and I took it out and I handed it to her and she ripped it out of my hands and when she said thank you, our eyes locked and it was an interesting experience for me that changed the whole course of why i play baseball and even with the heartbeat behind starting that organization. When she looked at me, it’s like we connected in a weird way. Even though I wore nice clothes and I had a good job, I was lost, I was afraid , I was alone and I didn’t know what to do to ask for help. And I am looking at a girl who is lost, alone, afraid, needs help, doesn’t know who she is, and it’s almost like we were running down the same path but it looked way different. I understood and I wanted to help her. When she said thank you it wasn’t just thank you but it was thank you for letting me know I exist because everyone acts like I am not here. I felt so alone in that same way. Baseball is so intense and you’re on your own. It’s a numbers thing and it’s like figure it out. It’s like our worlds met and I remember thinking I want to help people like this. I want to be able to play the game and help people. I didn’t want everyone to worship me but I wanted to have a platform to help people. I just started researching a lot of poverty and my buddy from Kansas City wanted to get this hunger initiative going so I helped finance it originally just to get it going and once he got it going I thought to myself ‘I need to do this up in the Northwest.’ So I brought that into an organization I wanted to start. Initially it was more I wanted to tell kids to surround themselves with people who believed in you and I wanted to do something for young people to get them thinking a certain way. But I had people coming up to me and telling me that if you don’t meet people where their needs are at, then they aren’t going to listen to you and what you have to say. Most of these kids need leadership but these kids come from environments where they have to steal food to survive and sell drugs to help their parents make rent. I needed to start looking into poverty and realizing these kids may not be impoverished food-wise or housing-wise but they need to be met in a certain scenario. I saw the importance of just being good and loving people as human beings and these kids thrived on it and had them feeling like they are making a difference. And that’s what I wanted to do. I wanted to change culture and I wanted people to get out of their selfishness and to get into being a servant and understanding that being a servant is a good thing. It is actually meeting people and loving people and just saying I want to help you because there is a need. I had a perfect opportunity as a baseball player because doors were open to me and the platform was there and I just enjoyed it. I started learning about trafficking and wanted to help stop that and to me that is one of the biggest, if not the biggest injustices of mankind. I brought that to the table and I am seeing young leaders who see that they can do something now. It’s not just being an athlete or a celebrity, it’s taking something you are good at and helping others. Anyone can achieve their dreams and that’s what I did. I achieved my dreams. I am going to continue doing that and leadership. As a retired player I have that resume and a platform and I am using that platform to continue doing great things. I am very thankful for baseball and what it meant but it has also provided me with the ability to move on and start a new chapter. Who was your favorite teammate to play with over the years? That’s a really hard one to single out there because there was a lot of people. I have a couple to be honest. Brian Fuentes, who is retired, that guy is awesome. We’re actually going to do more stuff together now that I am retired. We’re hunting buddies. Guys that are currently playing, Matt Cain and Buster Posey are two of my closest friends. And they are more than just friends, they’re like brothers to me. I don’t say this lightly but I would really take a bullet for those two guys and I care about the families and marriages and kids and I really enjoyed getting to know them and I am going to miss having a lot of time with those guys. Mike Sweeney was also a really close friend of mine in Kansas City and he helped me get through a lot of things. Jason Grimsley, who was a reliever, and I’ve stayed friends with him even after he left the game. He taught me a lot about the mental side of the game of being a reliever. Matt Herges, who is a coach now, he meant a lot to me and still does and he really helped me understand pitching. You don’t have a lot of good, solid friends like that in the game. You’re with guys so much that they become your buddies. In the offseason, you get to be with the people you want to be with and not who you have to be with. There’s guys in the offseason that you’ll just see in Spring training but some guys who you want to stay in contact with. What was the hardest part about being a Major League Baseball player? The hardest part was dealing with the mental part of the game. You fail, you’re frustrated and mentally it just wears you down. If you’re talented enough to make it to the big leagues you’ll get there but those guys who aren’t mentally tough enough wont stay there. It’s really battling the two things of being afraid to fail and afraid to succeed and you have to find a medium. That fear of failure drives you to be good and to be great and to work at your skill and not want to fail but it is going to happen. So you cant fear it totally. But that fear of success is a mental battle too because once you start competing at a certain level everybody, media, fans, the team, front office, coaches, you have an expectation to continue to do that. And you can’t do that every time. If you have an unable year and set the bar and you don’t do that well everybody thinks you’re losing it or having a down year or had luck. So you’re afraid to succeed because you don’t want to be held to that standard they cant duplicate. And guys don’t want to fail on the big stage and be considered a loser. So trying to deal with those two things and keep it on an even keel the whole time is the hardest thing about the game. Those guys that can handle it stay in the game for a long time and those that don’t, no one is ashamed if they cant handle it they just don’t make it. It’s not embarrassing. When there’s been guys who couldn’t hack it, I shook their hand and said you gave it all you got, congratulations for getting to the big leagues and good luck in your next career and that’s really how I feel. It is a really tough game to play and for me the mental side is what you have to really train yourself to deal with.